Free photos of Oregon Caves National Monument, taken on a visit to the Caves on June 6-8, 2004. 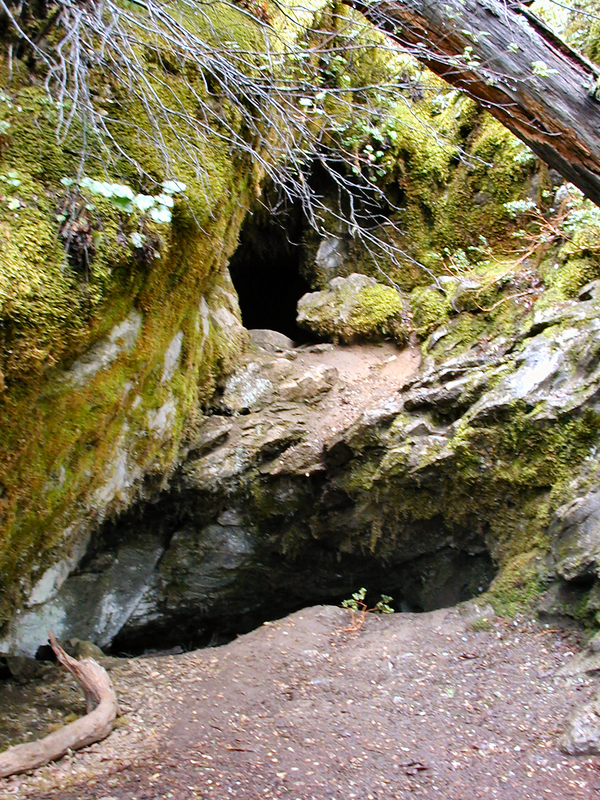 The main entrance to the cave. 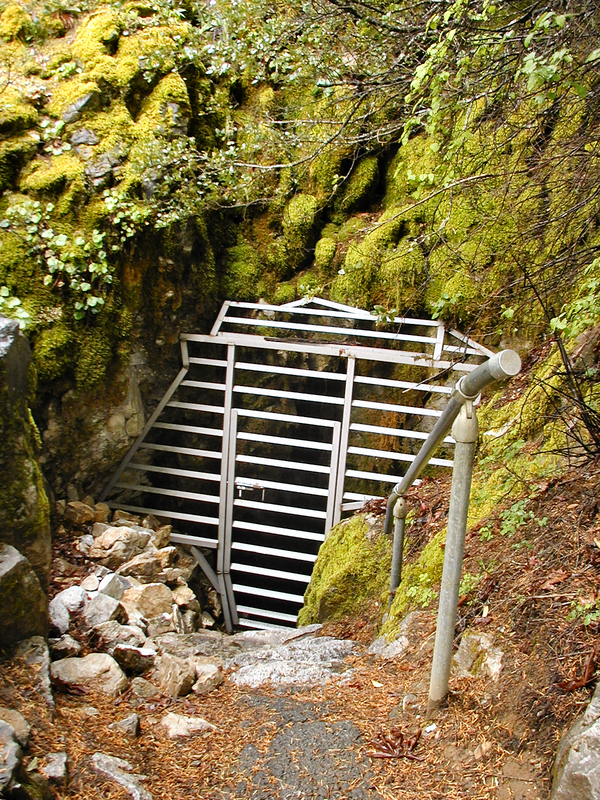 The Oregon Caves were discovered in November, 1874 by 24-year-old Elijah Davidson, who was deer hunting. More correctly, the cave was discovered by "my famous bear dog, Bruno", in the words of Elijah. The story is Elijah was hunting down a large buck. He took a shot at it, but it wasn't a clean shot, so the buck didn't go down immediately. With Bruno leading, Elijah followed the mortally wounded buck's trail. When he reached the now dead buck, the dog immediately sensed a bear nearby and, being a "famous bear dog", he of course got very excited. So Elijah released the dog to give chase. After all, a bear was a much better prize than a buck! The dog followed the bear into a thicket, where the bear escaped into a cave hidden by the brush. The dog dove into the cave after the bear and Davidson followed. It was too dark to see, however a yelp and squeal indicated that Bruno had found the bear. Elijah stumbled around a little in the dark but without a light he couldn't see far enough into the cave to shoot the bear or rescue his dog from the bear. So he reluctantly left the cave and a very lucky Bruno soon limped out behind him. Elijah then came up with the idea of luring the bear out using the dead buck as bait. He dragged the buck's body to the cave entrance and left it there overnight. Sure enough the bear came out that night and, after feasting on the dead buck, layed down and went to sleep. That poor old bear ate so much he was stuffed! The next day Elijah returned to find the bear soundly sleeping near the buck carcass, just as he had expected. Not good for the bear, as he would soon be permanently stuffed! Interesting, while at the time he was excited about killing this huge bear, the lasting legacy for Elijah Davidson turned out to be his discovery of the Oregon Caves! An example of the forest surrounding the cave. Almost from the day of it's discovery the cave became a tourist attraction. In 1909 President Taft officially made it a national monument. 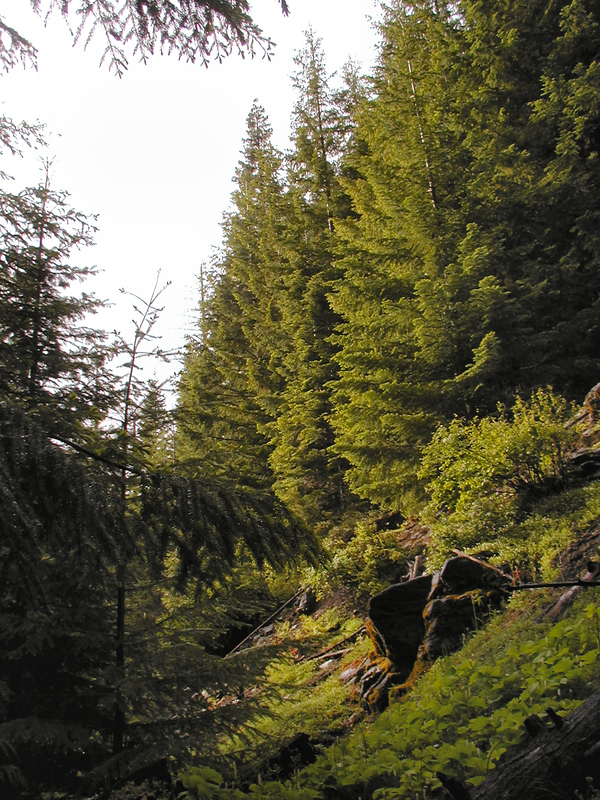 The cave then fell under the management of the Forest Service. 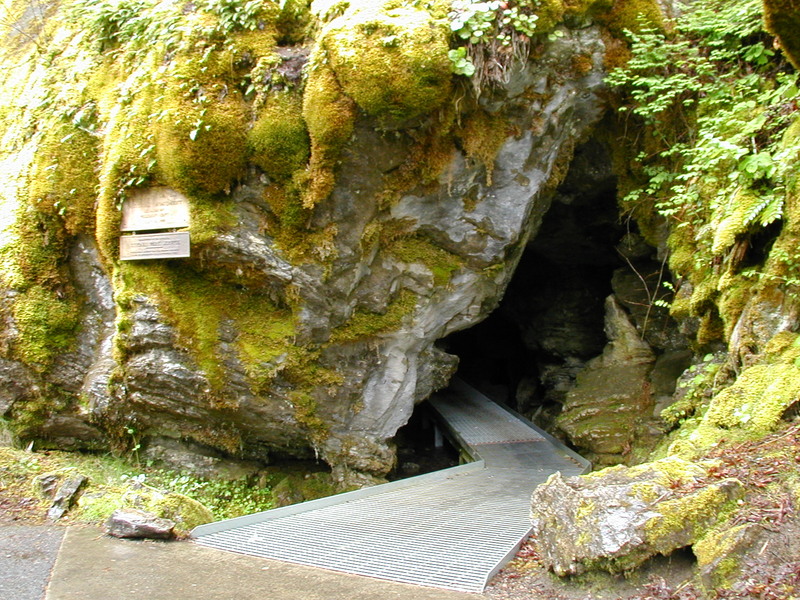 In 1934 the responsibility for the cave management was transferred to the National Park Service. That same year the Oregon Caves Chateau (hotel) opened, providing overnight lodging and meals for guests. The Oregon Caves Chateau is considered one of Oregon's greatest lodges for it's architecture. Today it still remains in original condition, including the original furniture. 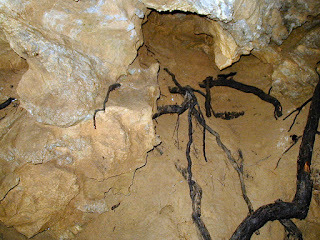 Tree roots growing into the cave from a tree above. During the 1930's the inside of the caves were blasted in places to allow the installation of pathways for tourists. 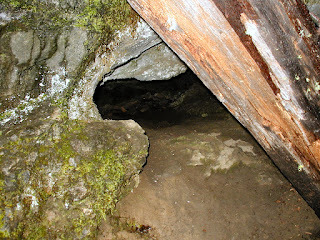 New tunnels between sections of the cave were also constructed to allow easier access. 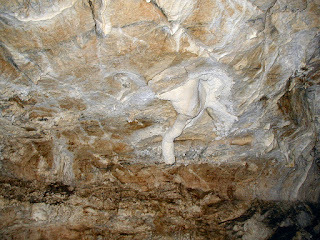 Unfortunately this construction and the subsequent visitors caused much damage to the caves. 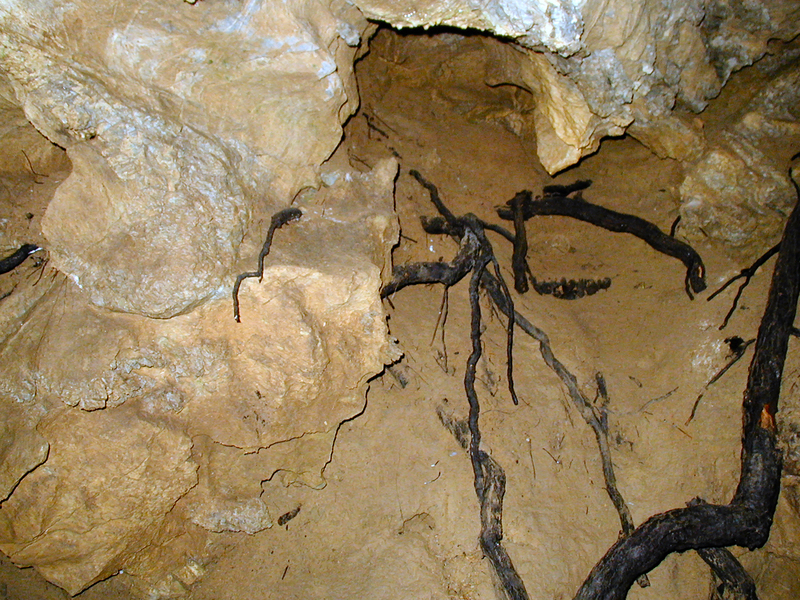 The new tunnels changed the airflow in the cave and parts of the cave began to deteriorate as the air caused changes in the cave's climate. 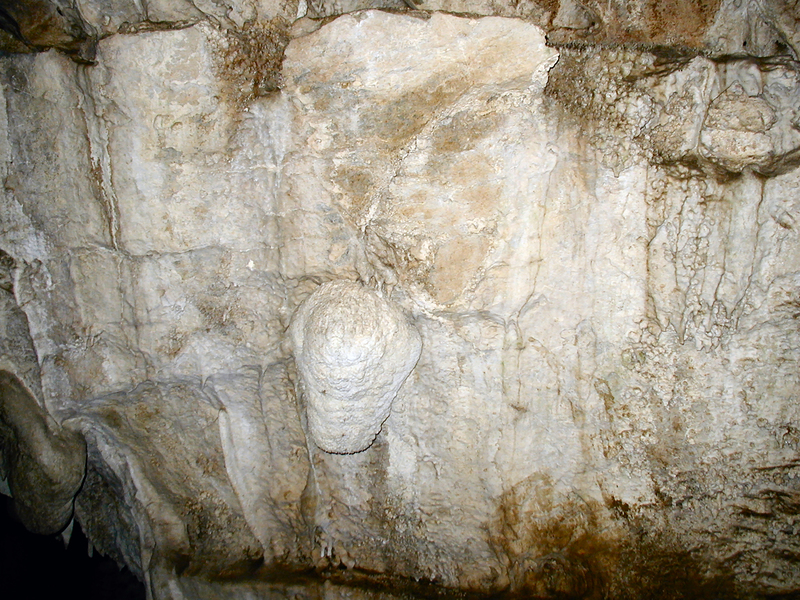 Starting in the 1980's the park service began expending much money and energy in an effort to reverse damage caused by the earlier construction and visitation in the caves. Air-locks have been installed in the blasted passageways to restore the original air flows. 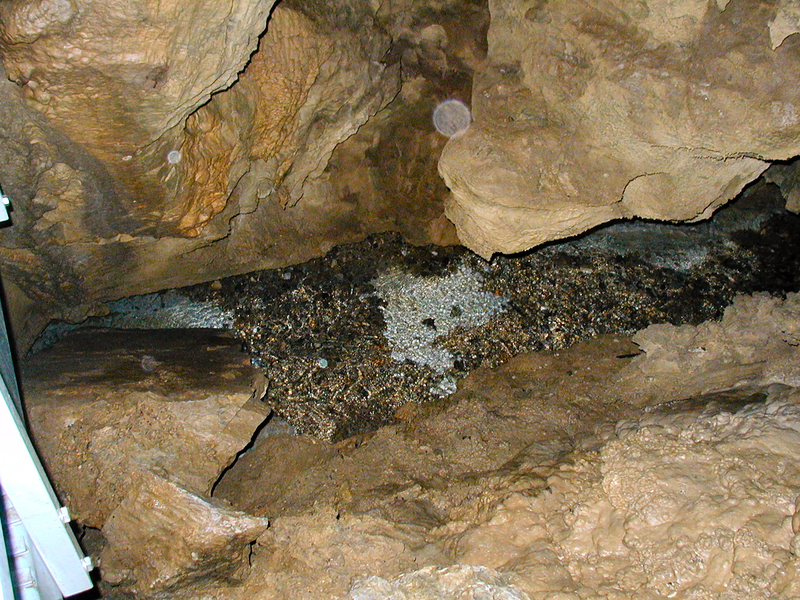 New lights have been installed and tons of debris have been removed from the cave. 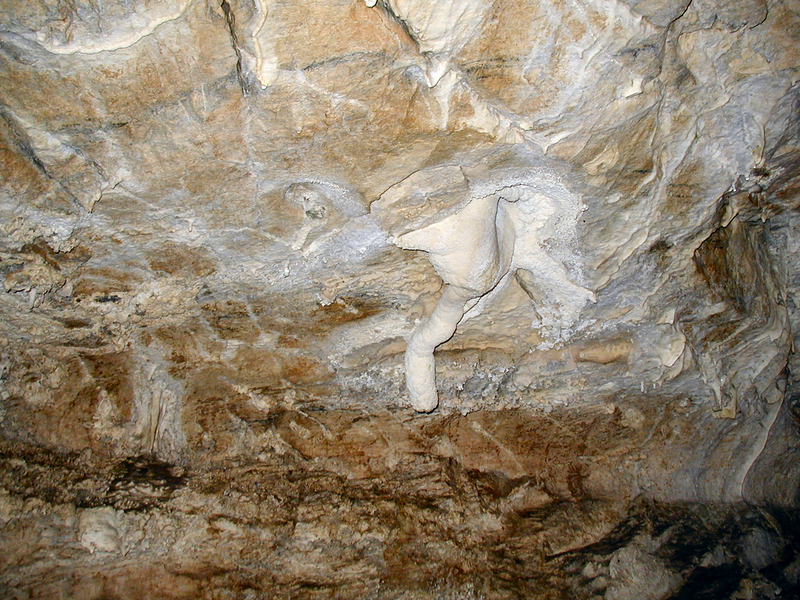 Some cave features that had been damaged or broken were repaired. The cave's marble ceiling. 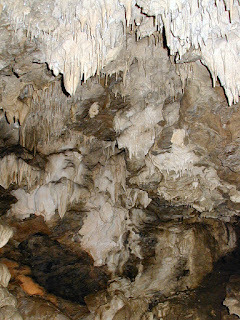 The cave was dubbed "The Marble Halls of Oregon" by poet Joaquin Miller, around 1907. A cave formation called a "mushroom". A clay cave formation appropriately called a "cave worm". These tiny, hollow cave formations are called "soda straws". Other formations you may see at Oregon Caves include Columns, Stalactites, Stalagmites, Cave popcorn, Rimstone dams, flowstone, cave ghosts, boxwork, and Moonmilk. Have fun! This is the river Styx in the cave. Most rivers in caves are called the Styx. It's more like a creek than a river. The water from it flows out of an opening near the main entrance and down into a pond by the Chateau. From there it flows through the Chateau (yes, right through the dining room!) and down into Cave Creek below the Chateau. One of the cave exits (there are several). The gates are designed to allow space for bats to fly in and out between the bars. 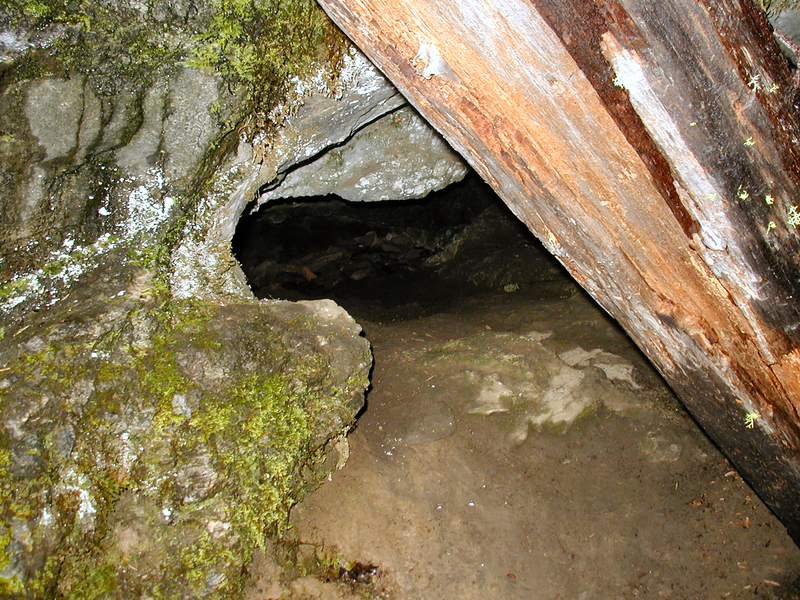 Many smaller caves are found in the area. Most are only a few feet deep, or too small to get in to. Another small cave. 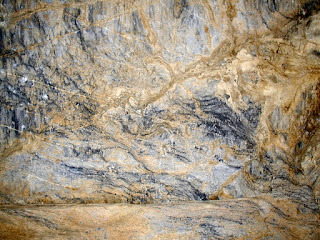 Some of these connect to the main cave system. For the number of interesting and unique cave formations you will see in a relatively short tour, Oregon Caves is undoubtedly among the best caves in the United States. While it is a bit out of the way to get to the caves, it is well worth the time. Just outside the main entrance to the cave is a really great old lodge, the Oregon Caves Chateau, which is owned by the Park Service and operated by a local non-profit. It is worth taking a look as it is considered one of the best examples of classic rustic hotel architecture, with huge log beams, log stair cases, etc. Best of all it get few visitors and so it is in almost original condition.